October 7, 2012, filed under ART FOR PEACE, PRASRA 2011; 2 Comments. May 4, 2012, filed under PEACE STRIKE EVICTION ON PARLIAMENT SQUARE, PRASRA 2011, VIDEOS; No Comments. So, with the removal of Peacestrike peace boxes from Parliament Square, the new restrictions on protest under the Police Reform and Social Responsibility Act have been enforced. These ban any kind of sleeping equipment that can sustain long-term protest, as well as any kind of amplification equipment that demonstrations use and need. Maria has been protesting 24/7 since 2006 in Parliament Square. 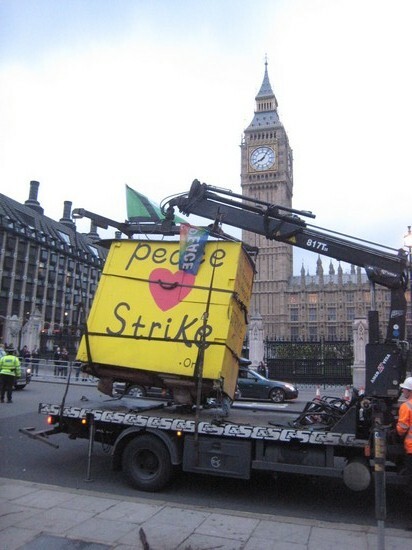 It has been the base for so many Peacestrike activities including daily petitions to 10 Downing Street, speaking out about the causes and consequences and the horror of war, and supporting the protest of others. 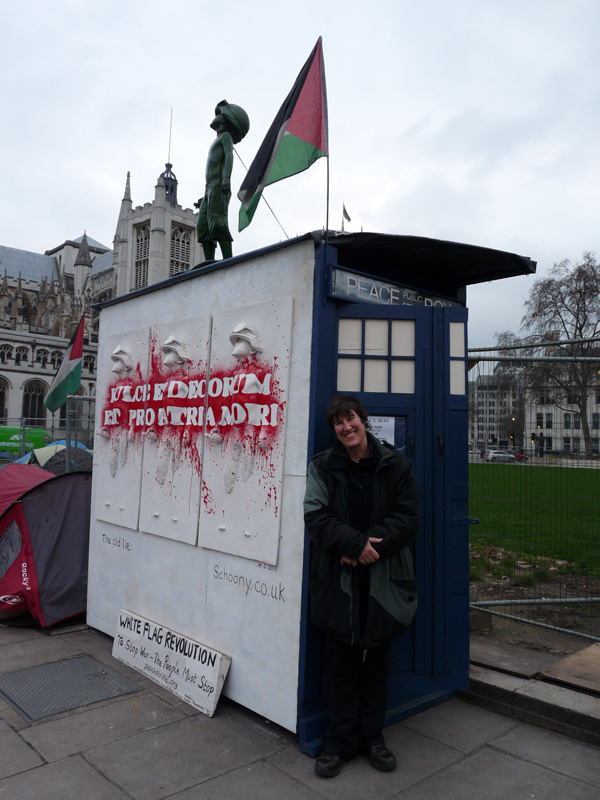 The peace boxes more lately became a focal point in Parliament Square with their powerful statements, art work and all-round creative approach to use of the space. 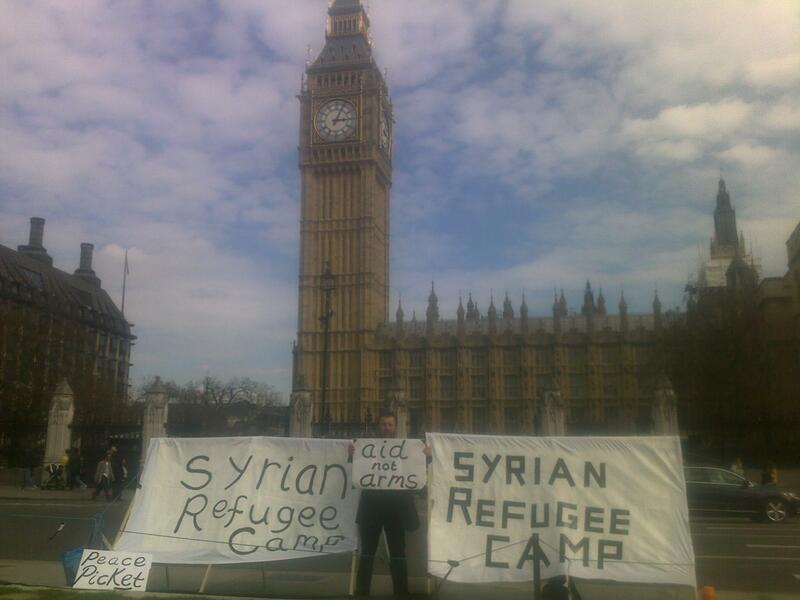 The protests in Parliament Square have for 10 years been a visible expression that war is wrong and have become a place where those who wish to express their concern and sorrow in relation to war can gravitate towards, a space of common concern within the anonymous city. With nothing but a single placard, sleeping bag and plastic sheeting, Maria spent last night on the pavement, determined to maintain her protest. At 3am the police arrived and gave her a warning to hand over the sleeping bag which she did. They informed her that she would be issued with a summons to appear at court. 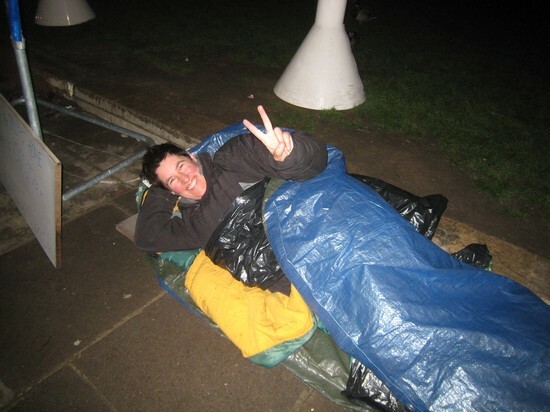 Maria argues that it is vital to be able to sleep in order to sustain a long-term protest. Without sleeping equipment, that becomes very difficult and the protest is undermined. Maria and the lawyers who have challenged the new restrictions on protest will go to the Court of Appeal and, if necessary, the European Court of Human Rights, to contest the case against the law. 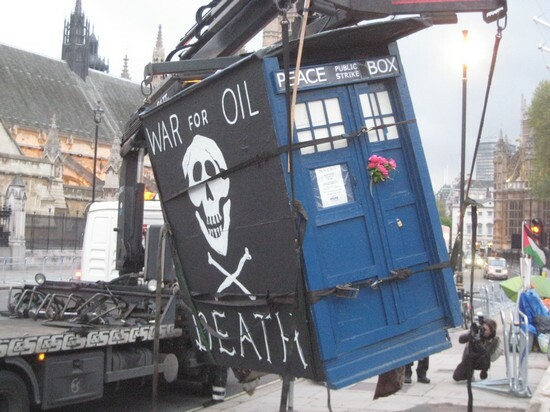 , filed under PEACE STRIKE EVICTION ON PARLIAMENT SQUARE, PRASRA 2011, VIDEOS; No Comments. Below are press articles, video and pictures of the removal by police of the remaining peace box, tent and other items. , filed under PEACE STRIKE EVICTION ON PARLIAMENT SQUARE, PRASRA 2011; No Comments. 3 May 2012 – after a further court hearing the injunction protecting Maria’s protest from the new law is lifted. Maria will apply to the Court of Appeal and, if necessary, to Strasburg to contest the new restrictions on protest. At around 6pm the police turn up and start to remove the Peacestrike protest. See this article from Peace News about the new law and the recent legal proceedings.